It's impossible to forget the terrible images of the World Trade Center from September 11, 2001. Many in New York witnessed the destruction in person and millions more saw it on TV. As a result, it's understandably easy to forget what the World Trade Center looked like during happier days. The photos of the World Trade Center in this collection were taken by talented photographers from all around the world. The gallery includes striking images of the pre-9/11 skyline, views from the Top of the World Observatory, and even photos taken inside the towers. The Twin Towers glow during sunset over Manhattan. The shadows of the World Trade Center over the lower east side of Manhatten. A stunning view of the Twin Towers and the Manhattan skyline at night. The Tribute in Light pays tribute to those who lost their lives in the World Trade Center attacks. A view of the World Trade Center towers as dusk fell. Fritz Koenig's Sphere for Plaza Fountain, the sculpture that was the centerpiece of the World Trade Center Plaza. The lobby of 1 World Trade Center taken July 17, 2001. 56 days before it was destroyed. A map of the shops, restaurants, and other businesses that were located in the World Trade Center Concourse. To see the map more clearly, click "View Full-Size" and then click on the image itself. Ironworker David Rice on site at the World Trade Center in 1970. A ticket to the World Trade Center observatories, one of New York City's top tourist attractions. The incredible views from the famous Windows on the World restaurant in Tower 1. Image of the top of Tower 1 and the view north of Manhattan, New Years Day 2001. A view of the Brooklyn Bridge and Manhattan Bridge from the World Trade Center. Looking out at the lights of the city from the World Trade Center Observatory at night. A panorama of the Manhattan skyline with the World Trade Center. This is the view as you entered the World Financial Center from the pedestrian walkway that linked it with Tower 1. Looking down on the World Financial Center from the World Trade Center. The sculpture Ideogram by artist James Rosati was located in the World Financial Center Plaza. 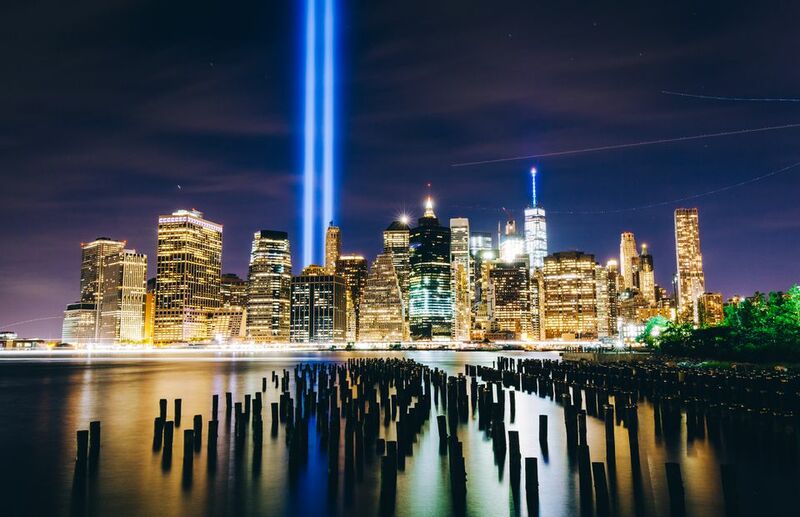 The Tribute in Light display is an annual commemoration of the lives lost and the fallen towers on September 11, 2001. This view is from the roof of the garage where the Tribute lights are located in Lower Manhattan. This view overlooks the rooftop of the garage where the Tribute lights are located in Lower Manhattan. Also visible are light trails of birds circling inside the light beams. The Tribute lights are turned off periodically during the night to allow the birds to disperse.